Our resident archery expert James Hancock gives his verdict on the Buck Trail Blackhawk…. From personal experience of these bows, having shot both the 30# and 40# versions, it is clear to me that the Buck Trail Blackhawk represents true value for money, and I can highly recommend them to any archer who enjoys traditional shooting at a very affordable price. The Buck Trail Blackhawk is an American style Flatbow made by Raven Archery. The overall length of the bow is a huge 68 inches, and this provides the shooter with a very long and smooth draw, which delivers an arrow to the target with great speed, but little hand-shock. It is designed to be shot off the shelf, using either a leather pad or hair rest, and constructed from multiple wooden laminations, with clear glass over the limbs. This is in keeping with the traditional look of the bow. My personal opinion on shooting this bow would be to use a style of shooting called “canting the bow”. This is where the shooter leans the bow so that the arrow is sitting on an almost “v” shape. This is a great technique, used by many bare bow archers because it is a quick way of moving the bow out of the archers line of sight, so he may line up the shot, as well as adding stability to the arrow and making it a lot easier to shoot the arrows quickly (snap shooting). 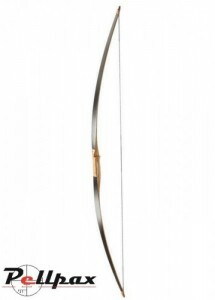 Available in both left and right handed and with a draw weight range from 30-50# this is a versatile bow which can be used for everything from field archery competitions, to hunting (as appropriate according to the law in your country). I think the draw weights around the 50# mark are much better to use, providing you are able to draw these, since the arch of the arrow isn’t as much as the weaker powered bows. This is because the higher the power, the flatter the trajectory of the arrow, which will make your shooting a lot more accurate than a bow which you have to aim well above the target at longer ranges. The best arrows to be shot with this style of bows to maintain its accuracy and smoothness would either be wooden or aluminium arrows. My personal preference would be wooden arrows with feathers on them rather than plastic vanes, but an aluminium arrow would shoot well from these as well. Carbon arrows can be quite unforgiving to shoot due to their lightness and speed which is why they are better suited to more precision shooting such as with a recurve or compound with sights. Personally I would make my own wooden arrows because there is great satisfaction when you have put in the time and effort into making something which looks quite often better than those you can just buy, and they shoot great! At Pellpax we can supply all the materials you will need to build your arrows from the wooden shafts themselves to the arrow points and feathers. A few more things to consider when purchasing this bow. There are certain accessories every archer will need to get at some point such as finger protection from the string, an arm guard again to protect you from the string, and a quiver to hold your arrows for you whilst you are shooting. I would personally suggest that any beginner archer should use an arm guard until you have worked out a good enough technique to not need one (although the string can still catch you!). I don’t really like using arm guards, as I find if the string hits me then it’s a tough reminder that my technique is flawed, and I need to bend my arm more. My personal equipment preference would be to keep with the traditional theme, and get a leather shooting glove rather than a tab. This is because they not only protect your fingers, but keep your hand warm when winter shooting, are easy to use, and they look great. In terms of a quiver, I love to use a back quiver, much like you see in every Hollywood film where there is a bit of archery. Many people struggle to get their head around how to use one of these and end up chasing around after their arrows like a cat after their tail, so for beginners it may be better to go for a side quiver instead, which can simply click onto any belt. In conclusion, found the Buck Trail Blackhawk to be excellent value, due to its sheer quality, and I would recommend it as great bow for entry level and intermediate archers. If you would like to see our range arrows click here, and for arrow building materials click here. A lot more arrow-making supplies are available, so if you have anything in mind which you particularly need and cannot see on here, then please feel free to contact one of our staff and raise your enquiry. We sell the Buck Trail Blackhawk, in a variety of configurations, at the low price of £112.99. They can be found here. For all items suggested above, you can go to the head to the Archery Accessories section. And you can browse our entire catalogue, in our archery shop.